Lou Brock is one of baseball's all-time best base stealers and was instrumental in helping the St. Louis Cardinals win two World Series titles and one National League pennant during the 1960s. By the time his 19-year career ended in 1979, the speedy left fielder had amassed more than 3,000 hits and held the career record and single-season record for stolen bases. Lou has also been extremely popular with card collectors, appearing in many of Topps' iconic 1960s and 1970s sets, and continuing through modern products which still frequently house cards of the Cardinal great. This top list serves as a guide for some of the best Lou Brock baseball cards to collect. 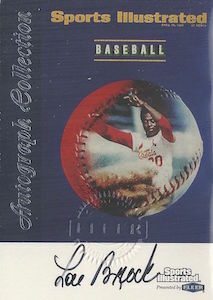 Shop for Professionally Graded Lou Brock Cards on eBay. Lou Brock started out with the Chicago Cubs in 1961. He played with the Cubs until the middle of the 1964 season when he was traded to the Cardinals who were looking for a player to emulate the Dodgers Maury Wills. Brock helped the Cardinals capture the 1964 World Series title over the favored Yankees and their star Mickey Mantle in the seven-game series. Over the next few seasons, Brock led the Cardinals to a World Series victory over the Red Sox in 1967 and another appearance where they came up short to the Detroit Tigers in the 1968 World Series. Beyond being remembered as an important player on the 1960s Cardinals championship teams, Lou Brock was also considered to be the greatest base stealer in the history of baseball. Starting in 1966, he led the National League in stolen bases a total of eight times over a nine-year period. In 1974, he set the single-season stolen base record by swiping 118 bases. In 1977, he stole his 893rd base, passing Ty Cobb as the all-time stolen base leader in MLB history. Brock held the career stolen base mark for 24 years until fellow Hall of Famer Rickey Henderson passed him in 1991. 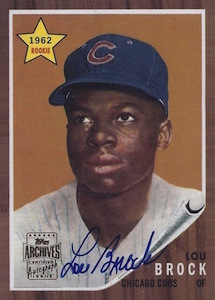 Kicking things off on cardboard, Lou Brock's rookie card appeared in the wood-bordered 1962 Topps set as a member of the Chicago Cubs. Collectors have long considered 1962 and 1963 Topps to be two of their best from that era and this has further enhanced the popularity of Brock's early cards. He made Cardinal debut in 1965 Topps and has numerous cards from his playing career with the team. While his early cards can be pricey and limited, the cards from the latter half of his career offer a wide array of price points and brands, from his standard Topps issues to several different oddballs. Since his retirement in 1979, Lou Brock has remained a visible part of the baseball card hobby. Collectors can still find his cards in modern products and he has been an active signer for several different card companies for the better part of the past two decades. His continued presence in the hobby has helped introduce him to generations of card collectors who never witnessed his play firsthand, but have gained an appreciation for the former great through collecting his cards and memorabilia. The following guide looks at ten of the best Lou Brock baseball cards, ranging from his early years as a Cubs outfielder, through his record-setting years spent with the Cardinals. In addition, while cards issued during his active career are prioritized, some of his modern autograph cards are also featured in the list. While many Cardinals fans might argue that the best overall card in the 1979 Topps set is the rookie card for Hall of Fame shortstop Ozzie Smith, the top Cardinals card in the set belongs to Lou Brock. This is because Ozzie Smith was on the Padres in his 1979 card. 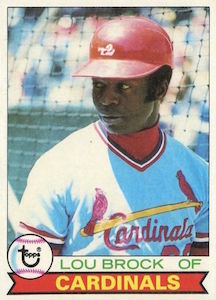 As the final Topps card of his career, the 1979 Topps Lou Brock card has added significance for Cardinals fans. Collectors can also find an O-Pee-Chee version of this card. Candy cards have played an important role throughout the history of baseball cards. In 1971, Milk Duds became a sponsor of Major League Baseball and produced a 69-card set featuring more than two dozen Cooperstown members. Lou Brock was actually the spokesman for Milk Duds at the time this set was produced. The cards were attached to the sides of the candy boxes and can be found both as a whole box and a hand-cut card. As most are hand-cut, the cards are condition sensitive and clean versions are quite popular for grading. 1999 Greats of the Game was an extremely popular, per-pack autograph product created by Fleer. 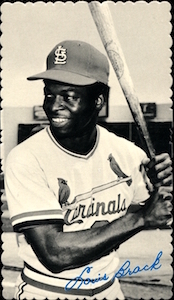 The cards feature the cover art from old Sports Illustrated magazines and the checklist is comprised of numerous Hall of Fame players and their autographs, including Lou Brock. While this was not his first certified autograph, it remains a popular option with Cardinals collectors who can find numerous autographs of other franchise greats, such as Stan Musial, Bob Gibson, and Enos Slaughter, within this set. Brock spent the majority of the 1964 season helping the Cardinals win the World Series, but there were no update or traded sets at the time, so his first Cardinals card came in the 1965 Topps set. The Cardinals team set features the rookie card of Steve Carlton, but the Lou Brock card is also very in-demand with St. Louis fans. His card appears in the high-numbered series, which were short-printed, and makes this card one of the tougher veteran cards in the release. 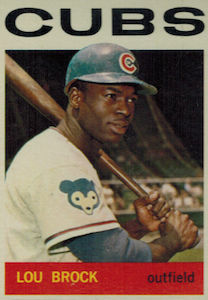 The 1964 Topps Lou Brock card was his last card as a Cub and it is also his most affordable as a member of the North Siders. While most of Brock's early cards are held in high esteem by collectors, the 1964 Topps set was not nearly as popular as the previous two years. One factor could be a thin pool of rookie cards, but many collectors do not like the design of these cards with the team name taking up too much room at the top of the card. If you are looking for an affordable vintage Lou Brock card, this is a good option to target. 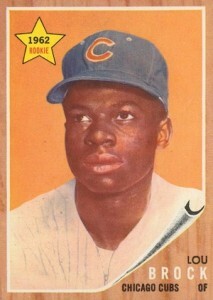 1963 Topps is one of the most popular products from that era and houses one of the important Lou Brock cards. Many collectors like the design, photography, and sharp colors found on these cards. The set also features some great rookie cards, such as Willie Stargell and Pete Rose. This Brock card is found in the short-printed high numbers, making it harder to find and more desirable with vintage collectors. 2001 Topps Archives was a product the company put out during their 50th year as a baseball card manufacturer. The set features reprinted rookie and final cards for hundreds of popular players whose careers overlapped with the Topps era. Boxes of Archives also offer autographs of many of the players in the set. The signed cards were tiered into several rarity groups and Lou Brock's autograph actually appears in the toughest group of signers in the set. While Lou Brock's autograph is generally an affordable option for collectors looking for HOF signatures, this card is easily his toughest, most sought-after, high-end autograph. In addition to the base sets, Topps had some really popular inserts in their 1960s and 1970s releases. From posters to iron-ons, Topps offered collectors many different options beyond their standard sets. While a majority of the more popular insert products appeared in the early parts of Brock's career, before he gained the notoriety to be included in the smaller, star-based sets, he did make the cut on several during the 1970s. One of the more popular Lou Brock inserts is his 1974 Deckle Edge card. These cards are scarce and in high demand, especially given the challenges of finding copies in good condition. The Brock card is one of many Hall of Famers included in the set and highly-graded copies of this card can be very expensive. One of the scarcest and more expensive Lou Brock cards comes from the 1971 Topps Greatest Moments. There are 55 cards in the set, but they had a low distribution and are condition sensitive due to the black borders. 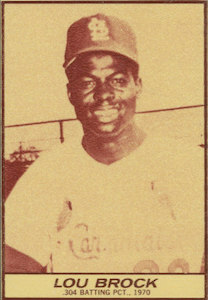 The front of the cards feature a highlight from the player's 1970 season with a newspaper-style blurb on the back. 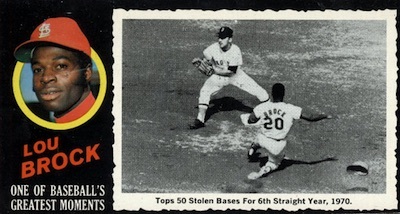 Brock's card recognized his sixth consecutive season with more than 50 stolen bases. This elusive card can often command a price far beyond his rookie card when high-grade copies come up for sale. 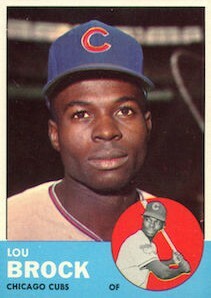 The most popular Lou Brock card is easily his 1962 Topps rookie card. While the wood designs seem to draw mixed reaction from collectors, this is one of the most recognizable Topps sets ever made. Lou Brock shares the rookie spotlight in this set with Gaylord Perry. 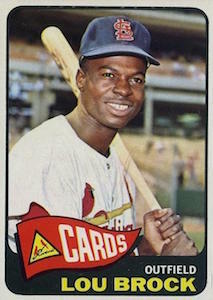 Although 1962 Topps is noted for the many variations, the Lou Brock card is not among these. The background coloring on Brock's card is one key to finding a clean copy of this rookie card as many now display a faded-orange color behind the portrait-style photograph.